Generally speaking, I’m not big on Valentine’s Day. I think it’s a bit silly, really. I don’t go in for the bright red and shiny decor that seems to show up everywhere this time of year. Or rather, that shows up the day after Christmas. I find it jarring and slightly depressing, though that might be because I always have some post-Christmas letdown and I don’t feel ready to dive into a new holiday just yet. I prefer to just enjoy and embrace the quiet of winter. But I digress - on to the good stuff. Though I don’t love all the elements of a commercial Valentine’s day, I do find heart-shaped foods to be charming. 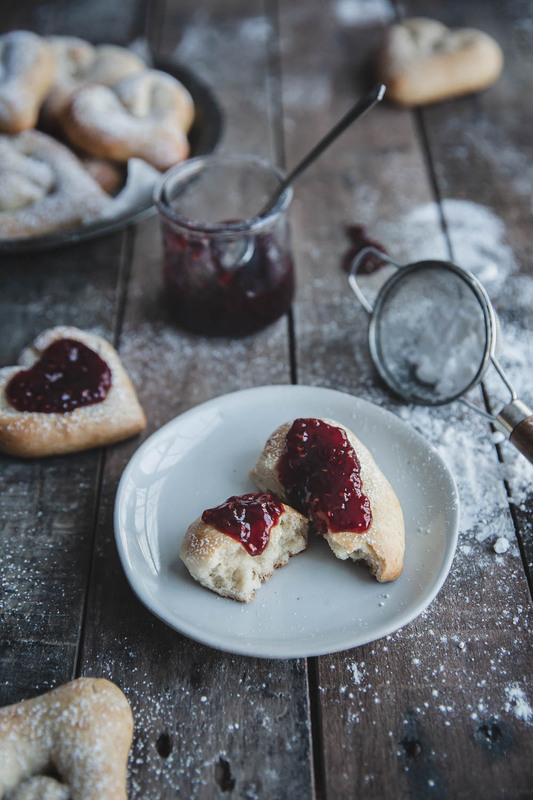 And I confess that I enjoy the more sweet and simple versions of the holiday - like the Valentine treats that the kids share at school, or a homemade Valentine card. 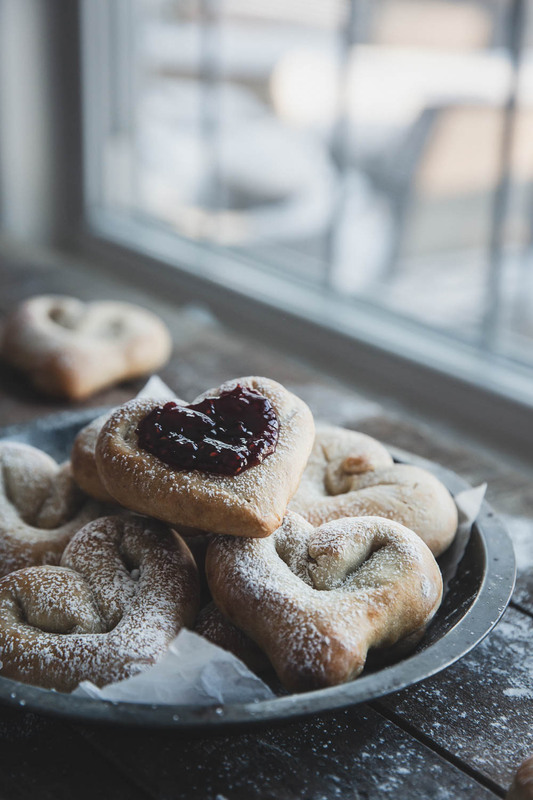 It’s in that spirit - the spirit of a slow and gentle, homey holiday - that I created these heart-shaped cardamom buns. For these buns, I started with the dough that I use for my kannelbullar (Swedish cinnamon buns) and modified it slightly. The buns are lightly sweet, balanced with a hint of salt, buttery, and gently flavored with aromatic cardamom. 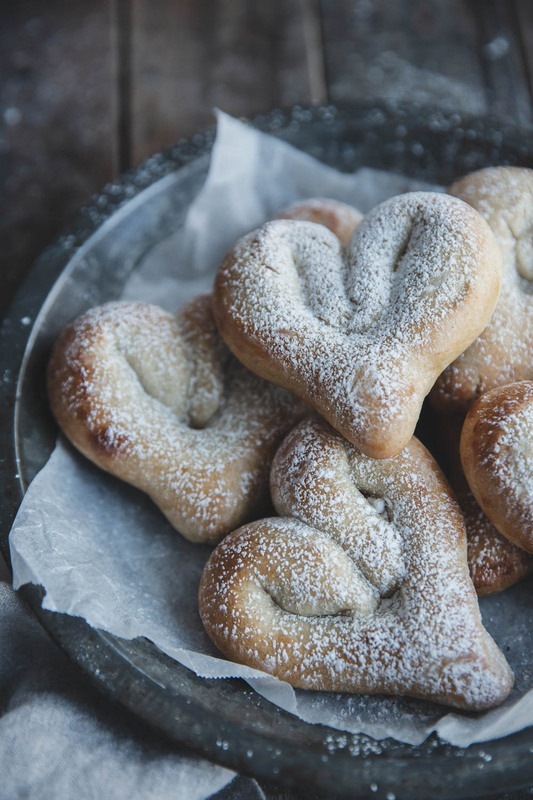 They’re a dense bun, almost like a soft pretzel, which makes them feel hearty and satisfying to bite into. I like to dust them with powdered sugar and serve them generously smeared with raspberry jam and butter. They make a good breakfast treat and they’re perfect with that afternoon coffee or tea. 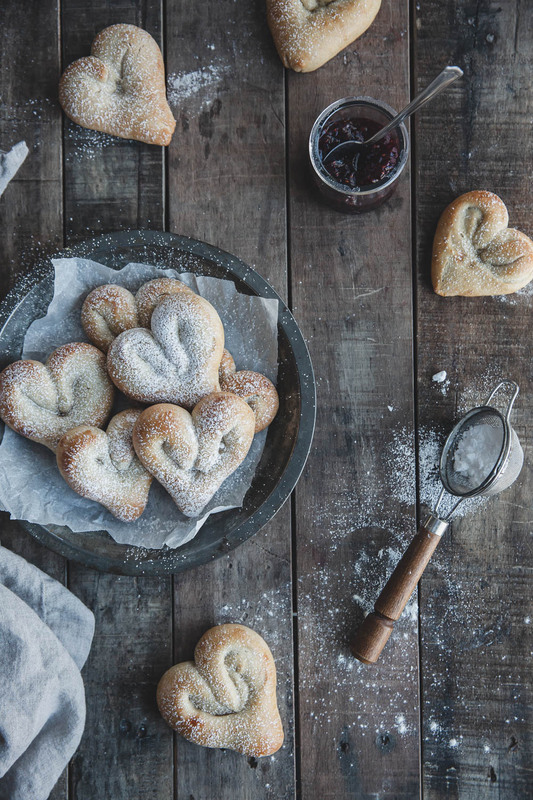 The dough comes together easily and is soft and pliable, so it’s easy to shape them into hearts. I recommend starting the dough in the morning, or even the night before, and baking up a batch for an afternoon treat. Especially if it happens to be a cold and wintry day outside. They keep well for several days, and I strongly suggest reheating them and serving them warm. They’re softer and seem more indulgent when they’re warm. Though I made them heart-shaped with Valentine’s Day in mind, they’d be a fun treat to make for any day. Have you gotten your free ebook yet? Everyday Favorites is a collection of some of my favorite everyday baking recipes, perfect for any occasion. In addition to this ebook, you will get access to the whole library with ideas for holidays, baking, and photography advice. Come check it out! Yes! Take me to the free stuff! Heat the milk and butter together over low heat until the butter is melted. Remove from heat and let cool to lukewarm. In a large mixing bowl, mix together 2 ¾ cups of the flour, the sugar, yeast, cardamom, and salt, making sure not to put the salt directly on top of the yeast. (Salt and yeast do not get along well.) Stir or whisk to combine the dry ingredients. Pour in the melted butter and milk mixture and stir to combine. The dough will be quite wet, more like batter, so add ¼ c. of flour at a time until you have a very soft and slightly sticky dough. I use my hands at this point, so I can feel the dough and get the consistency I want. It should feel very soft and a little sticky at first, but as you work it the stickiness will start to ease up. If it is really sticky, add a little more flour, being careful not to add too much. Too much flour makes the dough hard and dry when the buns are baked, instead of staying nice and soft. When the dough has lost its stickiness, dump it onto a clean surface and knead it for about 10 minutes. If you notice the dough is fighting you and not becoming stretchy, let it rest, covered, about 10 minutes. This will let the gluten in the dough relax and when you go back to it, it will be softer and more compliant. Place the dough in a lightly greased bowl. Cover and allow to rise until approximately doubled or it doesn’t spring back when poked, one to two hours, depending on the temperature in your kitchen. Once the dough has risen, remove from the bowl. Knead the dough a few times, then cover and let rest a few minutes. Meanwhile, line two baking sheets with parchment paper. After the dough has rested, divide it into 12 equal portions. (Don’t worry about them being exactly equal, just approximate.) Working with one portion at a time, form the buns, while keeping the rest of the dough covered. To shape the buns into hearts, roll the blobs of dough into logs about 4 inches long and using a sharp knife, make a slice ¾ of the way down the center of the dough log, so it looks like a pair of pants (trousers, if you’re in the UK). Gently pull the legs to elongate them and then fold them back into the uncut center. Do this with both legs so you have a heart shape. (See photo below.) Place the buns on the parchment, cover, and let rise again for ½ to one hour, or until the dough barely springs back when pressed. While the dough is rising for the second time, preheat the oven to 400° and make an egg wash out of a beaten egg and a teaspoon of water. When the buns have finished their second rise, brush on the egg wash and place in the oven. Bake for 14-17 minutes, or until the buns are a light golden color and sound hollow when tapped on the bottom. Allow to cool on a rack for several minutes before eating. Dust with powdered sugar, if you like. The buns are best warm and I recommend reheating them if you’re not going to eat them right away. I pop them in the microwave for about 15 seconds each. They will keep, covered in an airtight container, for up to 3 days. I particularly like to eat these with a dusting of powdered sugar and a spoonful of raspberry jam. Or a big pat of butter. Or both.